Freeholder Kathryn A. DeFillippo, Freeholder Director Douglas Cabana, Dr. Lynn Siebert – Director of Arts Participation & Communications, Tom Werder – Director of Morris Arts (holding Proclamation); Freeholders Deorah Smith, Heather Darling and Deputy Director Christine Myers (photo by Guy Palmiotto, HUB Camera Club). Representatives from Morris County’s arts and cultural community gathered in support of the Proclamation which also coordinates with National Arts and Humanities Month, a coast-to-coast collective celebration of culture in America organized every October by the national organization, Americans for the Arts, and comprising the largest annual celebration of the arts and humanities in the nation. From arts open houses to governmental proclamations, curtain speeches and special events, communities across the United States join together this month to recognize and celebrate the importance of the arts and culture in our daily lives. Members of the Arts and Humanities Community present in support of the Proclamation, L-R: Amy Curry (Executive Director, Morris County Historical Society/Acorn Hall) and her Research Assistant, Joe Garafolo; Cleveland Johnson (Executive Director, Morris Museum); Ed Kirchdoerffer (General Manager, Mayo Performing Arts Center); Guy Palmiotto (HUB Camera Club); Martin Prentice (Morris Arts Board Member); Dr. Anne Matlack (Artistic Director, Harmonium Choral Society); Terry Scullin (Morris Music Men); Tom Werder (Executive Director, Morris Arts); Tara Skirzenski (Board Chair, Morris Arts); Erin Keating (Shakespeare Theatre of New Jersey) in front of artworks by Bascove. 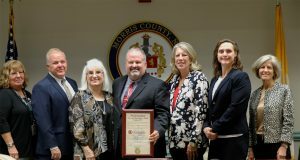 Freeholder Director Douglas Cabana presented the Proclamation to Tom Werder, Executive Director of Morris Arts, on behalf of the larger arts and humanities community in Morris County. Werder highlighted the importance of the arts to the health of the County and its impact as an economic engine for the area. He added “I am honored to receive this proclamation on behalf of Morris County’s vibrant arts and humanities community. In today’s world, the arts are more important than ever, bringing us together, rather than dividing us. The vibrant arts and humanities are a key feature that attracts people to live, work and play in Morris County.” During October, Morris Arts will be featuring the numerous cultural and arts events in Morris County on its website cultural calendar at www.morrisarts.org. Additionally, Morris Arts has made the Proclamation available for arts and cultural organizations to read or post in order to highlight the month and educate patrons about the arts in our communities. To see the official County announcement, click HERE .